Star Trek: The Next Generation is thirty years old this month! To celebrate, Redeeming Culture is assembling the finest crew of culture redeemers from all over the internet to investigate the spiritual harmonies in this cornerstone of science fiction. We’ve brought Kevin C. Neece out of transporter stasis to talk about season 6, episode 4: Relics. When the Enterprise detects a signal from the USS Jenolen, a Federation transport ship that has been missing for seventy-five years, sensors indicate a strange gravimetric phenomenon; which turns out to be a Dyson sphere, an incredibly massive structure built around a star. On the sphere’s surface, they discover the crashed Jenolen and, improbably preserved within the ship’s transporter, Captain Montgomery Scott. Scott’s arrival on Picard’s Enterprise turns into a life crisis, as he finds himself woefully out of step with 24th century technology and increasingly in the way. This episode is a personal favorite and one which, for its extra nerdy sci-fi premise of the discovery of a Dyson sphere, manages to remain a small character story about aging. It is famous, of course, for its detailed reconstruction (only partially a set build) of the bridge of the Original Series Enterprise 1701 (“no bloody A, B, C, or D,” in Scotty’s words). 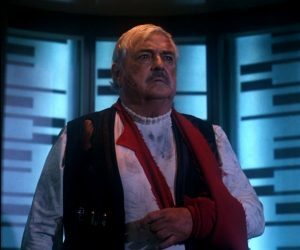 But the real star is James Doohan, who turns in a sympathetic, colorful performance as Scotty, at the time believed to be his farewell appearance in the role. He would return a final time for Star Trek: Generations, but this episode is really the send-off story his character deserved. It also stands as the third and final appearance by a TOS regular in The Next Generation, another nod of approval from one generation to the next. Ageism is a sin and it exists far too prevalently in our culture. Every time we bemoan “entitled millennials” or dismiss “racist granddads,” we play into and perpetuate negative stereotypes about people based on their age. 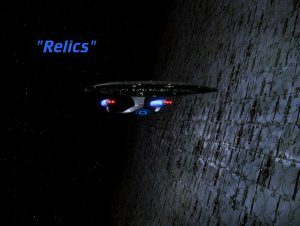 The title of this episode, “Relics,” refers to Scotty and the Enterprise 1701, both relics of a bygone age; and the relationship between the two. It is when Scotty reconciles with his attachment to the past that he is able to confront the present. 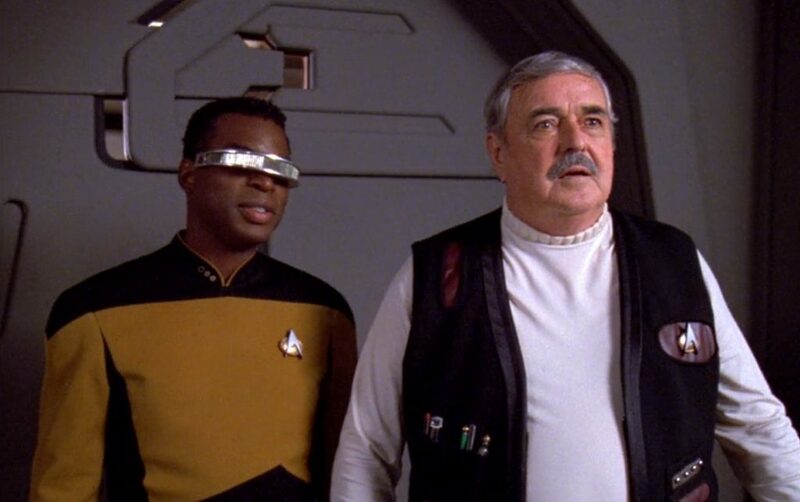 Having earlier attacked Geordi with lines like, “I was driving starships while your great-grandfather was still in diapers,” he stops dismissing the current Enterprise’s Chief Engineer for being younger, but takes too much to heart some of Geordi’s more hurtful words. 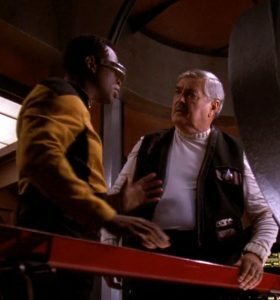 Geordi too had judged Scotty for his age, too easily losing his patience and telling the venerable engineer that he was “in the way.” He sees his error and begins to point out the good things still present in the aging Jenolen, a peace offering meant to metaphorically reinforce Scotty’s usefulness. The two men have to repent of their attitudes toward one another, showing forgiveness through encouragement and kindness. It takes humility on both their parts, but once they begin to appreciate and respect each other for who they are instead of clashing over their differences, they are able to work together to save the Enterprise, devising a solution neither could have come to on their own. Paul, in his letter to Timothy, advised the young man, “Do not address an older man harshly, but appeal to him as a father,” and also, “Speak to younger men as brothers.” Both sides of this advice are at play here, as each has spoken to the other harshly. The sin of ageism, like other forms of bias, is really the sin of pride—pride in our own age, our own experiences, our own abilities. Repentance, then, must take the form of humility, which is really an act of love. “Instead of being motivated by selfish ambition or vanity,” Paul wrote to the Church at Philippi, “each of you should, in humility, be moved to treat one another as more important than yourself.” As Scotty and Geordi each embrace this ideal, they show us what can be accomplished on the other side of pride. What if each of us were to take stock of the ways in which our pride causes us to judge others and let go of that pride in favor of humility? What might we be able to accomplish that we might never otherwise have been able to achieve? Thanks for reading Trektember on Redeeming Culture. We’ve got Kevin in captivity for another article; find out how many lights there are when he looks at Chain of Command tomorrow. Kevin C. Neece is the author of The Gospel According to Star Trek series and a speaker on media, the arts, and pop culture from a Christian worldview perspective.